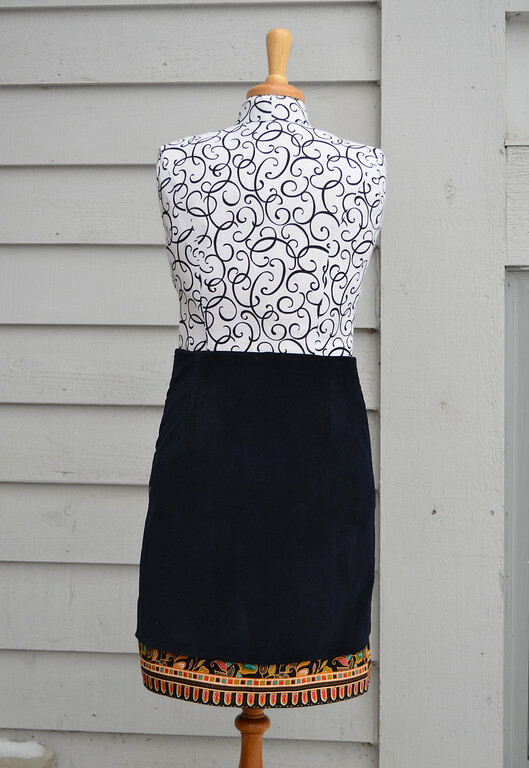 Skirt #2 was made in the more traditional sequence than Skirt #1.
for a modern sarong-party-girl look. I wanted very badly to do a curved hem in the batik, but that would have meant mini-darts in the pretty border. And also I wondered if it might look slightly Tinkerbelle-esque, which, again, is a look I can't carry off. So I left the hem straight. 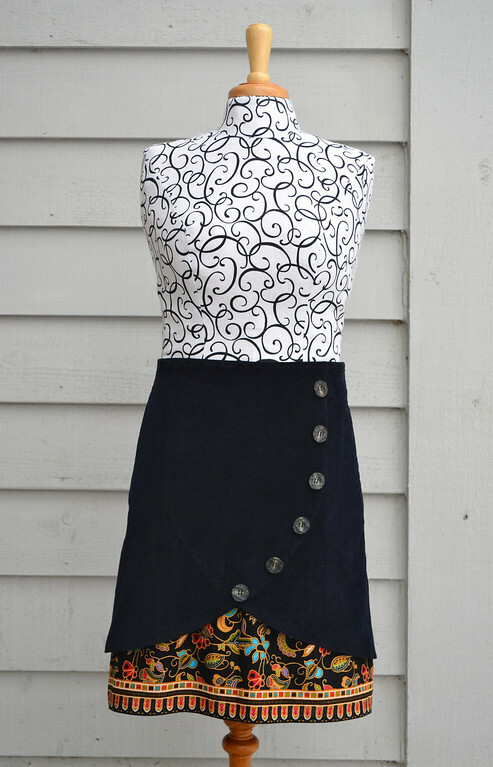 The softness of the batik gives the inner skirt some nice movement, so that it falls in waves, which is a nice contrast to the crisper corduroy shell. 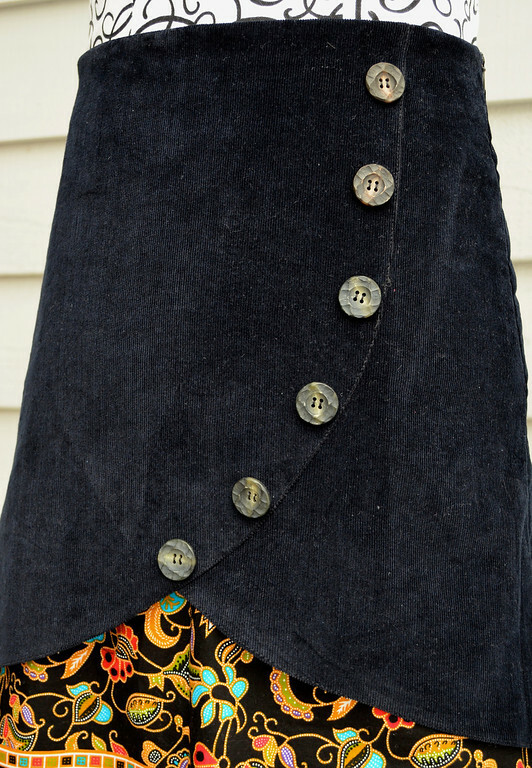 The outer skirt layer is black medium-wale corduroy, lined. 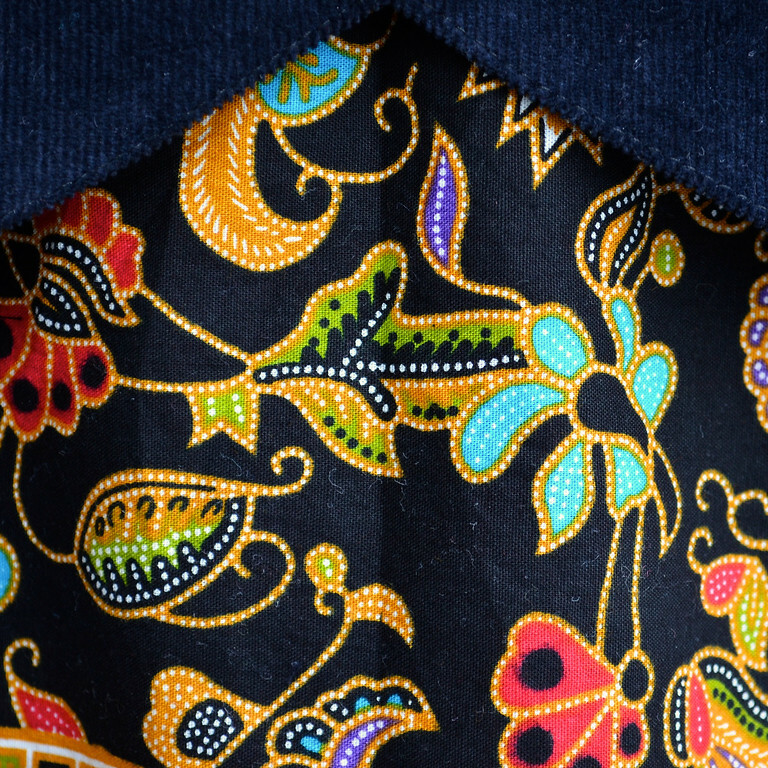 The inner layer is black cotton batik, with an unattached lining of its own. So four layers, two of which are lining. Here's the back - and if I'd thought this design through properly, I would've had the corduroy layer come all the way down to the actual hemline, tuxedo-style. Or lowered its hem so that only the border of the batik peeked out. What it looks like now is, as my mother would say, "neither here nor there." Note to self: do not attempt to design and sew clothes in a matter of days. and it zips up along the side seam. I'm done sewing, by the way. I made the deadline - and crossed the finish line at 10:34 pm, Sunday night. The tally was 17 garments and 1 felt toy. It sounds manic, but it was very relaxed compared to Halloween sewing, because everything was knit and functional and detail-less. Coincidentally, yesterday was the first day of the Chinese New Year, one tradition of which is all the kids get new clothes. At least they do in other families in Singapore. Our family always wore old shorts and Tshirts, preferably black because we couldn't stand to look particularly auspicious all decked out in red. I rolled my eyes when I realized that, inadvertently, I had made the girls new clothes in time for the New Year. Unbelievable. I swear - it was an honest mistake. If I pointed this slip to Mum, she'd say, "Crazy. What do you want to go and do that for?" Hee! I LOVE IT. Yes, I'm yelling. I love it. And now I have inspiration for a piece of fabric I've been saving for something really nice. Can we have a peek at the waist hem? Alas, Anna, I don't think I'm going to take any more photos of it. But the waist hem is no secret. There is no waistband. The innermost lining is sewn along the waistline inside out, and then turned right side out. 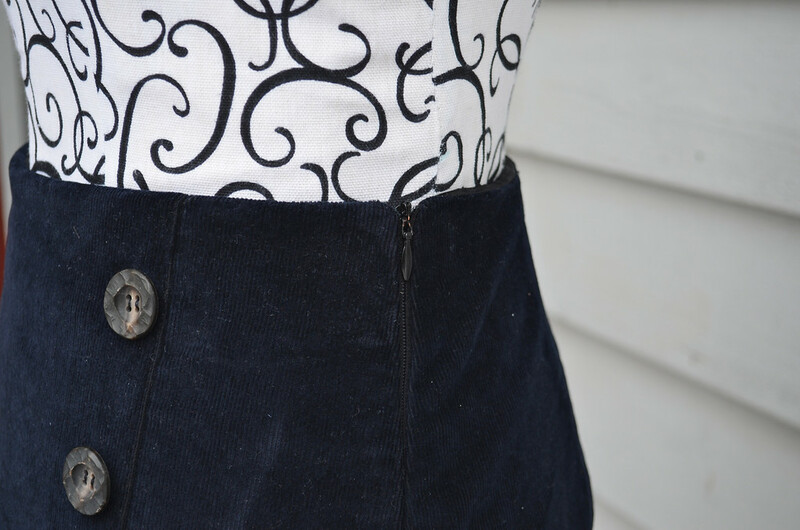 There is sew-in interfacing in the shape of a waistband to hug the waist. That's sewn only along its top edge (i.e. the waistline mentioned earlier). 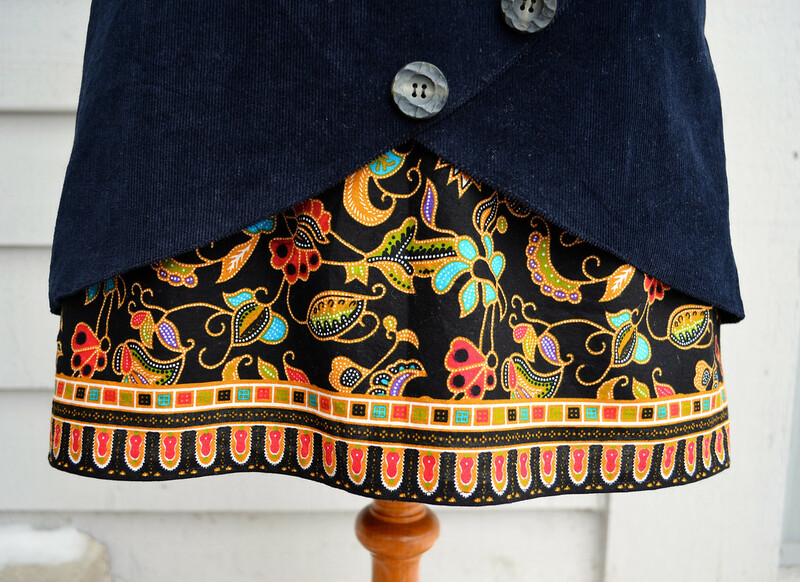 Its bottom edge hangs free, but as it (the interfacing) is sandwiched between the innermost lining and the batik, it can't be seen, only felt (in a good way), when the skirt is worn. This is really lovely. You are very talented. WOW! 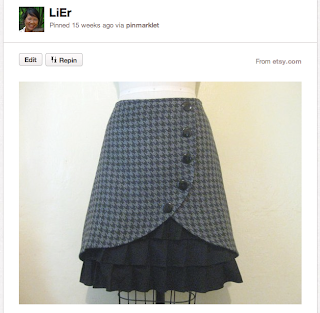 I really really REALLY like that Skirt! Its beautiful!!! And amazed that you made your deadline! Did you sleep? What felt toy did you make? L, I'm sure it is very well made and fits marvelously....BUT WHY THAT particular batik??? Because I was thinking of Singapore, wot! I was wondering if that batik was the Singapore Air fabric? I saw it and was happily reminded of a mug I got after flying with SA, and I think it was the fabric the flight attendants were wearing. What happy memories, that was the most amazing airline I have ever flown, like a flying spa!! Have a great trip. Yes! This is the black version of the SQ (Singapore Airlines) uniform batik. The colors I see them in (the flight attendants' uniforms) are blue, green and red (the backgrounds). I've been told their winter coats are solid wool, lined with this batik too. We aren't going on SQ to Singapore, though. We fly Delta. Not likely to make a skirt out of the Delta Air uniform fabric, I don't think! Adoro vir aqui e ficar olhando as coisas lindas que você faz, sempre com muito talento e amor. Parabéns pelas mãos abençoadas que você possui. òtima semana pra você. 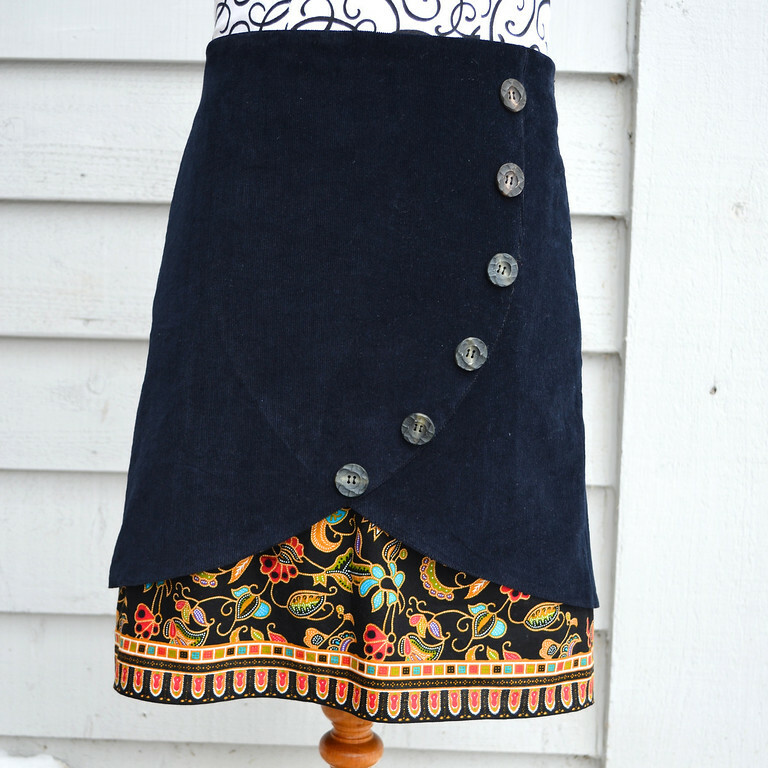 OH, I love this skirt (the denim one as well)!